There is a great variety of marketing tools, but what’s important is how they contribute to your conversion rate. No use spending a sizeable chunk of your budget on something that doesn’t get you the results you need. If you’re relying on calls to market your products or services, one tool you can look into is call recording. Basically, call recording allows you to record and subsequently listen to a random sample size of the calls and assess the performance of your strategies as well as the performance of sales reps. The main purpose of this is to be able to monitor and train sales reps, which ensures the quality of the calls and the conversations that your people have with clients or customers. Another way to capitalise on call recording is to identify where you are making your sales from. These days, more and more calls are being placed from smartphones, and it’s likely that people make the call after browsing through an app or checking a website. That said, if you haven’t already done so, it might be good to make sure that the relevant contact info is readily available on your website or app. If you can identify whether people are making calls by clicking on the phone number on your website or if they got to your number via an ad you placed online, that also helps you acquire valuable metrics that will help you improve and streamline your marketing efforts. Analytics is a tool that really helps when harnessed properly, and having access to call data will greatly help your analytics efforts. Knowing where the best chances at conversion come from is also important when you want to make sure that your marketing efforts are efficient and profitable. You may want to funnel more of your budget into the more profitable sources. 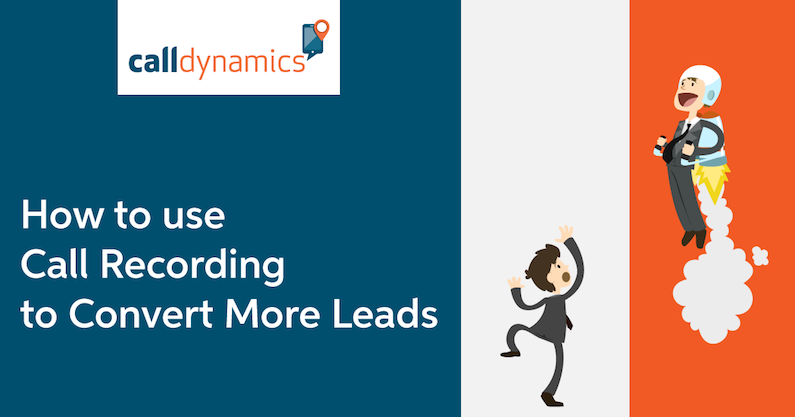 Call tracking software will help you pinpoint leads and also convert these leads better, thereby optimising your campaigns and improving your conversion rate. Sifting through call recordings will also let you see how well you are building your relationship with clients. Are the key points of your product or business being conveyed well? Were there opportunities to upsell? Do customers end up satisfied after talking with your reps? Do your brand values come across adequately? Those are just some of the important questions one should ask when evaluating calls. After those have been answered, the next step is to make sure the reps have the training and tools necessary to allow your business to build a rapport with each customer. If you’ve got better insight as to what strategies make people buy and what prospective customers commonly look for, then you will be able to convert more leads and become more efficient when it comes to the marketing side of the business. Recording calls and examining them closely is already a tool that you likely have at your fingertips, so the next step is for you to go and take advantage of this method to grow your business. What have you got to lose? Recording your calls with Call Dynamics is quick and easy. Use our 30 day Free Trial to see what it could do for your business.